Starting quote from an interview with TRS Radio, followed by some attacking tweets by Beth Gerdes led to a productive debate between myself and Throsten Radde. This debate took place over a month and consisted in more than 25 pages of content. With some down time after Ironman Texas I did my best, with the help of Thorsten, to cut this debate down to less than 6 pages and cover the talking points of our debate. This will explain why some of the topics are not fully covered and why the discussion jumps around at points. Please read it and then take to social media on your thoughts. If you have further questions send me a direct message on Facebook or Twitter. Thorsten – For our “debate”, I am happy to exchange some ideas and viewpoints. I haven’t listened to your TRS interview so I’m not sure what ticked Beth off. I saw some “finish in 12 hours and qualify for Kona as a woman” quotes? So, a few points from my end to stir the pot a bit ;-) I’ve been in touch with a number of men and women that were working hard to qualify for Kona in the last years. I know how much thought & work athletes have put into getting there. Can’t see that there’s one group for which it’s easier to “make it,” different challenges for every one! Some people are arguing that women’s IMs are less competitive than men’s. Basically, if there are twice as many men as women (the rough 2:1 ratio of Pro IM men to women), the gaps between the athletes should also be roughly twice as big. But maybe there is a flaw in that? Andrew – The problem with having data is when l speak out about an outlandish fact that was learned while collecting data is that I look like the bad guy. I admit I misspoke in the interview, I went back and looked at the numbers and it was 2013 in which a woman could have just finished the right races and made it to Kona, this never happened but it was possible. When I evaluated the numbers for 2014, I came back with 3800 points just by finishing last at every race, if you add the caveat of no slower than 12 hours she would’ve earned 4040, earning a paycheck at every race, but coming up short of a spot to Kona. After further review this puts them out of Kona “just by finishing.” Now had they improved by 1 position, finishing last to 2nd from last, at these events they would have qualified for Kona with 5170. Thorsten – Okay, so can we lay “a woman can qualify for Kona just by finishing a couple races” to rest then? I agree with you that there are way too many races with a small number of female Pros and/or larger gaps. But I think we differ on what we see as the cause for this – for you it seems to become a statement about “depth of women’s racing” in general, for me it is mainly a logical consequence of fewer Pro women. Andrew – We can discuss qualifying for Kona later, but on the “competitiveness” at world championships, I took 2004-2013 two years ago and no matter how I sliced it for the top 15 the men were just more competitive top to bottom. I tried to find somewhere, some glimmer of light but it just does not exist at Kona or at the average Ironman. The average spread at Kona is shown below from 10 years, overlayed with the spread for your 2013 & 2014 Ironman events that had at least 10 finishers. Things are certainly different now than they were in the days of Paula, and have again changed somewhat since Chrissie was so dominant. Also, that’s why I can’t really see a difference in drop-off anymore (again referring to my graphs in http://www.trirating.com/womens-field-as-deep-as-mens/ which look at the KPR years of 2011 to 2014). I find the graph that compares the women’s field to the men’s field in case there were the same number of qualifiers especially compelling. Andrew – I like your plot of comparing men and women top 10 at Kona. It is a little different spin on the plots I had in State of Long Distance Tri, part II. It is good that we agree that the way that Kona has to be raced for the men and the women are different based on field size. Looking at your graph that cutting down the field when WTC went from qualifiers at every race to the points system had little effect on the spread of the men’s race but, if you disregard the Wellington walloping’s, the women’s races have gotten better since cutting down the field and implementing the current points system. But if you expand the field the question becomes, do you think the Rinny would have won Kona multiple times if there was a 20 additional women train flying along “legally” drafting? If Kona went to 30 male field what would you think that would do to the race at Kona? What would opening the female field up to 50 do? Thorsten – It’ll be interesting to see how the women’s race dynamic will change in the next years – especially considering that everyone who tried to stay close to Daniela ran into issues on the run, and the top spots (behind Daniela) went to those that biked at their own pace. But as you said, the men’s race is “easier” to follow, but the women’s race might be more interesting as there are more position changes. The challenge is to make it interesting to those that are not familiar with each athlete’s strength and weaknesses. As for what the “best” size for Kona is, I really don’t know. From what I’ve heard is that a reduction of the men’s field would be positive (i.e. smaller “peloton” than what we have now) – and you’ll know by now that I would like to see more women in Kona :-) It seems that 40-40 would be a decent middle ground – but that’s not for me to decide, nor do I think that the data I have can be of much help here. I can’t really find why 40-40 (with all slots decided at the end of July by a system and number of races very similar to what we have for the 2016 season) isn’t a better system than what we have now. Andrew –– I agree and disagree with your thoughts on wanting everybody to show up to Kona in peak form. Some pro athletes are like age group athletes and just making the “dance” at Kona is huge for their sponsors. This will not change no matter the size of the field, but do you think there are 50 women interested in going to Kona, from the KPR inception it appears that only 45 women or so have made an effort each year? – I don’t think the “old KPRs” can be used as data to prove that only x women wanted to go to Kona – only that x women tried to qualify under the current system. Andrew – I think we are agreeing to disagree on whether the same number of professionals need to toe the line at Kona. I think we have talked the issue to death so let’s discuss what you mentioned earlier the journey to get there. I am one of the few supporters of the current point system. I did not think it was fair at first with the original linear points fall off and having 1000 pt Ironman races, but the revision is a lot better. The parabolic drop off really makes sure that athletes that generate strong performances end up at Kona. So let’s take a look at a few examples of how to make it to Kona in 4 race. I went and looked at the KPR stats, it historically takes a male 3700 points to squeak into Kona, here are 3 examples of what a man would have to do to qualify. 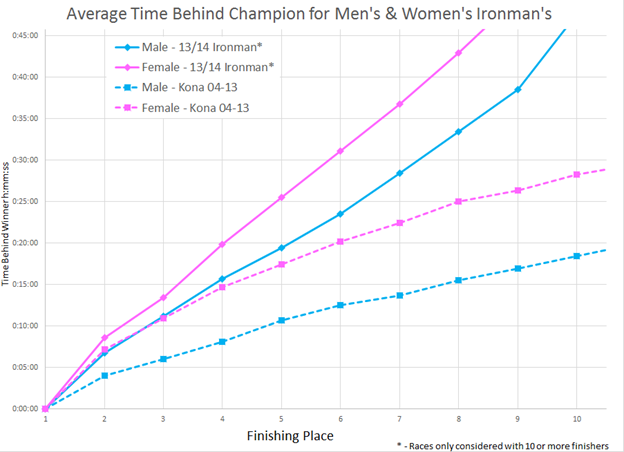 I followed using the stats gathered in “the state of long distance triathlon” to find where a proportional female to the winner’s time would finish. Then I went back to the KPR results and found that it took a female 4200 points to make it to Kona. Here is what I found. I think the system is pretty darn fair and extremely comparable for males and females. The best athletes throughout the year make it to Kona. Thorsten – Of course it’s hard and it should be to get to Kona. But one thing that a qualifying system has to account for is that it is not an end to itself but just a qualifying system. So in addition to “choosing” the best athletes to race in Kona it should also allow them to race Kona in their best possible shape and to make the race as interesting as possible. For example, that’s why I’m against August qualifying and it’s also why I think that the lower number of female slots and the increased number of races that women have to do in order to make it to Kona does not help in creating the best possible race in Kona. While it may not affect the top, top athletes, there are fewer “fit and hungry” almost first-tier and second-tier athletes that are willing to give it a try. That’s one of the factors that lead to a different dynamic in the women’s field. Andrew – Like we agree August qualifying needs to go, this will help pro’s show up in peak form and not just make qualifying for Kona a landmark. Yet, I disagree about the methods of getting there, in the interest of growing the professional sport of triathlon it should be mandatory to race your Regional Championship to race Kona. So everybody who is “just validating” will do it in the same place. Limit the field to the top 50 athletes in that continent/region, and that will help growth in developing regions get athletes (from Asia or Africa) to Kona. This will also create media circuses at races outside of Kona, look at Frankfort, epic showdowns with Raelert, Frodo, Kienle, and Van Lierde the last two years. Look at how much more successful sports are when there are rivalries and how many people watch those competitions in particular. Think about it, Oct Kona, Feb Africa/Middle East, Mar South American, Apr Oceana, May North America, June Asia, July Europe, this would create 1 weekend a month that you get trigeeks tuning in. Now think if you split the men and women, now you have a sport with two races a month building into Kona. This will create a system like the old ITU series that helped grow the ITU to what it is today. Speaking of ITU I really think WTC should adopt the rule of you must be within 10% of the winner in order to earn points. There are enough men to competitively fill 25 Ironman’s a year, but there are only enough to fill about ~15 female Ironman’s a year. In the interest of competition do you go to 15 each to be “fair” or do you make the total prize purse equal having the female races pay deeper? What is the answer? I don’t know. I do know it looks really good to have a field of 30+ pro’s laying the smack down, on the cannon forming into that arrowhead, on the bike having people going forward and backward all day long. A field of 20 athletes or less just does not have that excitement I don’t care who is racing. If you take your current race calculations and had 30 male races and 20 female races, what does your calculations look like for field size and level of competition? Thorsten – I agree with you, I don’t think there is too much that’s wrong with the KPR for the men as it is now. The only “major” change I’d do is to get rid of August qualifying. The “problem” that WTC has with the KPR, and why they are thinking of changing it is that so far their growth strategy was “more races” and that has reached the end of what can be supported by the Pro field. As you have noted, there are probably already too many races for the Pro women, and adding even more races, especially over the IM distance, will lead to fields that won’t have any Kona Pros in the field – obviously they need to think of different strategies to grow and to add races. Things are a bit more pronounced for the women. As you have noted there are races that don’t have a decent Pro field. While it is theoretically possible to qualify using a lot of “easy points”, the real-world impact on qualifying from these small races is pretty limited, I can’t really think of someone who made it mainly because of doing “easy races”, and as it’s sometimes surprising which races have a small field, it is next to impossible to build your qualifying strategy on them. What is the thing you are looking for in the discussion about “depth of field”? I can’t really see where having more women in Kona would negatively impact the men racing there. Are you arguing for different number of male/female Pro races and/or different prize purses? Not really sure what the “outcome” is to be that you are looking for? Andrew – What am I after? I want to grow the profession. Like I said I don’t think equality is needed in the sport, nor should it be a priority. If the professional sport of triathlon is going to grow, we as a whole need to get the top athletes to race more races against each other to get more “fans” of triathlon. How can you be a fan of an athlete that races 4 times a year, and only once do they actually race a loaded field? The rivalries need to become consistent because everybody enjoys tuning in for an old school throw down. Yet there are not many rivalries that play out more than twice a year. We need to change this. We need the top athletes to toe the line week in week out like the greats did in the 80’s and 90’s and helped build the sport to what it is today. Like you said let the tide raise the ship and rivalries do it. Right now so many guys dance around each other instead of racing head to head…this MUST STOP. When you go to a Futbol game, a Formula 1 race, you know who is hitting the turf, and that is why people attend. Triathlon should be no different, and this is why I am a huge fan of making it mandatory to race your Regional Championship. Frankfurt should be only open to the top 50 Europeans and should be required to race it in order to race Kona, the same should go for all Regional Championships. Then take the top 50/30 as of July 31. How else can we have competitive, an exciting race 30+ times a year? + Provide equal slots in Kona for WPROs. Would clearly indicate to the women that are valued athletes and that they are an important part of Kona racing. + Limit the number of races with Kona points. There were close to 30 Pro IMs last year, this year’s number of about 25 sounds more reasonable. Maybe even reduce to 20. This will make the men’s races even more contested, more “excitement,” and also help avoid races with really low numbers. + When re-designing the KPR, think about “direct slots” say 3 each in maybe 5-10 races. That’ll help to concentrate the best racers in these fewer number of races. + Not sure about making Regionals mandatory. What happens if someone has a DNF or gets a controversial DQ?! Very limited number of “backup options”. IMHO better to make these races even “more attractive” and “nudge” athletes into these races than force them there. 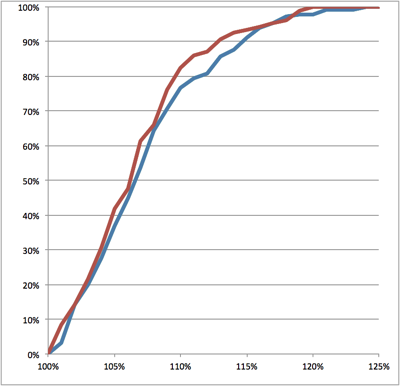 + Reduce the number of 70.3s with Kona points. The “thinning” that we see for IMs is even more evident for 70.3s. But I’m not really sure how to best do that. Maybe only “count” P-1500 and P-750 races for Kona? + Provide regular information about the number of registered athletes. I have suggested a while ago that WTC could send out a monthly or bi-weekly (in the middle of the season) newsletter to the Pros that includes the number of athletes that have registered for each Pro race (maybe with “strength” information such as “7 male (3 Top100) and 5 female (1 Top100) athletes registered”). This would also require being a bit more strict with late withdrawals. + Improve race coverage. We’ve already touched on this – lots of room for positive changes, not necessarily all that expensive. 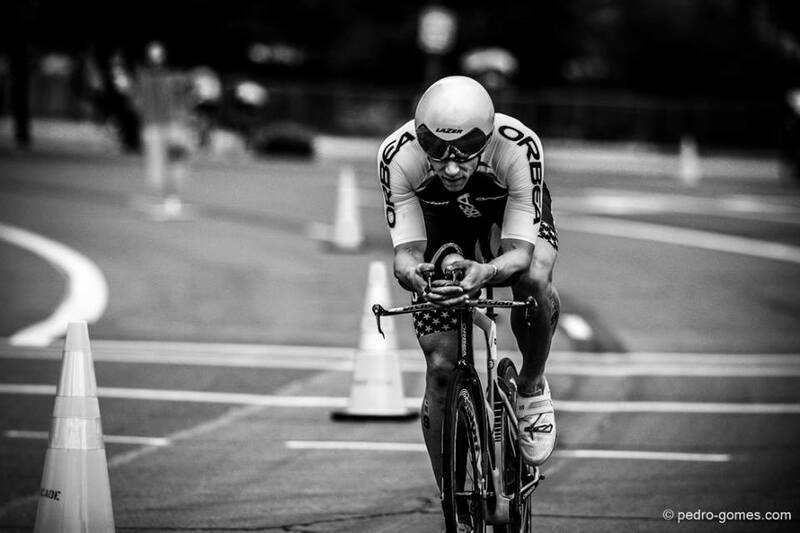 + Figure out how the next growth wave can occur without additional PRO races and Kona slots. Once you have that in place, (8) can help you drive that growth, so best to make sure you have (8) in place as soon as possible! Andrew – I agree with some of the ideas and disagree with others. Like you mentioned I agree races with dedicated men’s and women’s pro fields will help grow the sport. I have pushed for it for a long time and discussed it in State of Long distance triathlon Part III, and I look forward to seeing it’s success this fall. My question now becomes, what is the future? What can WTC do to make Ironman coverage riveting? Thorsten – That’s an area where I hope that WTC is going to step up their game: Making “following Ironman racing” more interesting. For me that’s two parts: Make the actual race coverage more professional, and also provide a “season arc” going into Kona. Some of it is basic stuff, some of it is certainly harder but should be obvious. It doesn’t seem that WTC sees that as their obligation (as you know they aren’t really sure what to do with Pro racing), maybe there is a market for the Tri magazines (but they also mostly cater to age groupers that want to get better – “6 weeks to your best Olympic Distance”). I just hope that someone gives this area the attention it deserves. And with the men and women, there are two “groups” of stories that can be told. Andrew – Like you pointed out about “sportcasting” the sport, I strongly agree that this is a huge area of improvement. I appreciate the commentary of the WTC announcers but are monotone, they are full of incredible insight but lack that ability to drum up excitement for hours. Even myself finds me drifting into boredom listening to any of the race coverage of triathlon because the broadcastors lack broadcasting capabilities. If you listen to a great sportscaster they can make a rock sitting in a parking lot exciting for hours. Talking about near misses of grocery carts rolling by, the angle of the sun, cars, kids walking by, ect. You know where I stand. For me the future involves investment in mainstream media (broadcasters, syndicated broadcasts), get the sport in front of the public so that people see it and want to do it. Fortune 500 companies will want to participate and invest in a guy or gal in spandex physically selling out on NBC Sports, BEIN, ESPN, and Eurosport on Sunday afternoons. If WTC makes this investment to grow the sport, for the next 3-5 years it should be mandatory that we as professionals make the same commitment and do 3+ Ironman’s a year to help with the hype. The way I see it, as long as we are all racing to the same rules, everybody at Kona has the same shot, and like you said rising tide lifts all ships! Thanks for your time Mr Radde. Thorsten – There is a lot that can be done to grow “Professional long distance triathlon racing”, and we touched on a number of points and ideas. In general we have a lot of common ground, but we don’t agree on female racing. Growing the participation of female athletes is a good growth strategy for Ironman, and giving equal weight to female Pro racing should be a part of that. There are a number of issues that Ironman has to work on to further grow the sport, and it’s going to be an interesting next few years. I hope that you’ll be able to have a part on the racing side! I thoroughly enjoyed debating Thorsten, we truly debated, agreed, disagreed, and agreed to disagree, and both now look at our numbers a little differently after our discussion. My head hurts! My debate with @ThRadde looked like a @realDonaldTrump rally with @protriunion & @50WomenToKona protesting outside! RT @starykowicz: My debate with @ThRadde looked like a @realDonaldTrump rally with @protriunion & @50WomenToKona protesting outside! Some of the women just unvoluntarely commented on the competive edge of the women’s field…. the title contenders for challenge roth complaining that Daniela (Ryf) will be competing! imagine Ronnie (Schildknecht) complaining if Sebi Kienle would have to come to zurich to validate (if he had to dnf in frankfurt: it won’t happen. imagine roger federer complaining that Novak is coming to basel to play at ‘his tournament’: it won’t happen! I think there should be fifty women in Kona, it’s just normal. but the competiveness of the field….. it’s just not the same! If you focus on equality it ceases to become a real competitive sport and becomes far less about actual competition. Look at sports that are attracting the best athletes as well as many fans like basketball and football. There’s a clear difference between the abilities of the men and of the women. If they started focusing on equality between the NBA and WNBA what do you think would happen to the sport? There’s a reason they’re popular and it’s not because people love watching equality. If you want to have a truly competitive sport you have to have people awarded based on their performance.